China Continuing Economic Boom or Bursting Bubble? 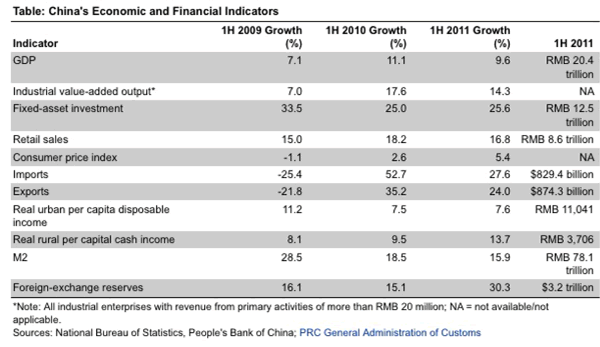 In thirty short years, China was able to accelerate her GDP from $216 billion to $6 trillion. She amassed reserve capital of $3 trillion. She reversed America’s fortunes from the greatest creditor nation to the greatest debtor nation. She gutted America’s factories while creating the world’s largest manufacturing base in her own country. A measure of output that highly correlates to GDP is energy consumption. In June of this year, 2011, China surpassed the United States as the largest consumer of energy on the planet. While the US consumes 19% of the world’s energy, China consumes 20.3%. While China was growing their economy by a phenomenal 2,800%, the US GDP grew from $2.3 trillion to $15 trillion – a mere 650% increase, of which 420% was due to inflation. There is no question that China’s progress has been remarkable. The question is whether that growth is sustainable and built upon a solid foundation. 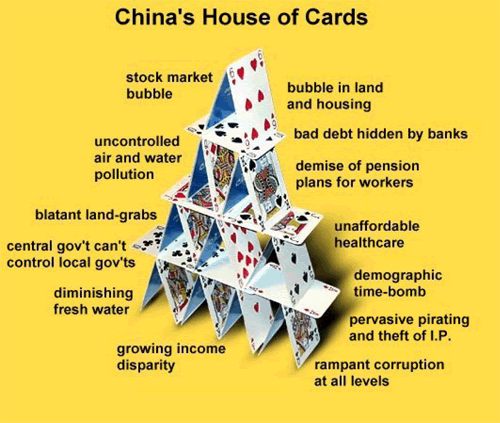 In a February 2010 Casey Report article titled Is China’s Recovery a Fraud?, my thesis was the $2.1 trillion stimulus package rolled out by Chinese authorities after the 2008/2009 financial crash was leading to enormous malinvestment. The officially announced stimulus package in November 2008 totaled $586 billion and was to be invested in key areas such as housing, rural infrastructure, transportation, health and education, environment, industry, disaster rebuilding, income building, tax cuts, and finance. In reality, the central government pumped an additional $1.5 trillion into the economy in an effort to maintain social stability through the subsidization of its industrial base. Chinese banks funneled cheap loans to state-owned enterprises in order to manufacture artificial profit margins to keep Chinese goods competitive and employment maximized. In the short term, the stimulus produced the desired effect. 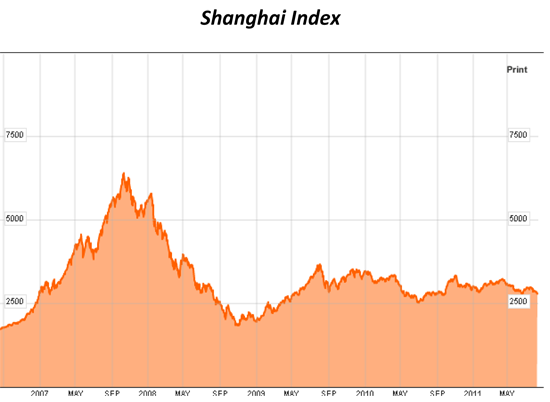 Specifically, the Shanghai Index – which had topped out at 5,913 in October of 2007 and had fallen to a low of 1,678 by November 2008 – responded to the stimulus by rebounding to 3,300 in January 2010, as the chart below shows. As with all monetary and fiscal stimuli, however, the initial high is always followed by a hangover. Today the Shanghai Index stands at 2,350, down 29% from when I penned my article. China is also experiencing accelerating inflation, a real estate bubble of epic proportions, a looming banking crisis due to the billions in bad loans made by Chinese banks as commanded by the Chinese government, and growing social unrest due to rising food and energy prices. There are few opinions in the middle regarding the China story. People are either convinced China is a juggernaut that can’t be stopped and will become the dominant world power (a recent, global Pew Poll found that 47% of respondents think China is or will be the dominant global power), or they see a colossal bubble that will burst and cause worldwide mayhem. While some might think my world-view has a negative slant, I tend toward what I think is healthy skepticism that causes me to view things in a more realistic manner. Based on the facts as I understand them, the Chinese government has created a commercial and residential real estate bubble in an effort to keep peasants employed and not rioting in the streets. In the case of the US subprime mortgage bubble, critical thinkers like Steve Eisman and Michael Burry figured out it was a bubble three years before it burst. Jim Chanos and Andy Xei have been warning about this Chinese bubble for over a year. They have been scorned by the same Wall Street shills who denied the US housing bubble. As Eisman and Burry proved (reaping billions), just because you are early doesn’t mean you are wrong. The table below paints a troublesome picture of rising inflation and gigantic over-investment in real estate. And this takes into account the fact that, much like the Bureau of Labor Statistics (BLS) here in the US massages data, the Chinese statistics are tortured by the Party to paint the best possible picture. Even still, the Chinese government’s own numbers show inflation escalating as economic growth is slowing. And the trend is not improving: The latest data show year-over-year inflation surging by 6.4% in June and food prices skyrocketing by 14%. With annual disposable income of less than $2,500 in urban areas and just $600 in rural areas, food and energy account for a huge percentage of the average Chinese person’s daily living expenses. The Chinese authorities are terrified by the revolutions sweeping across the Middle East and are desperate to put out the inflationary fires. To contain stubbornly high inflation, the Chinese central bank has raised the benchmark interest rate three times this year, including the latest rate hike of 25 basis points announced on July 6. In an attempt to rein in excess lending, it has also hiked the reserve requirement ratio six times, ordering banks to keep a record high of 21.5% of their deposits in reserve. Even with inflation surging, the Manufacturing Output Index fell to 47.2 in July – the lowest in 28 months, and indicating contraction. China’s automobile industry, which overtook the US in 2010 with sales of 18 million autos, has experienced a dramatic slowdown, with growth of only 3% through June versus 32% growth last year. For all of 2011, the China Association of Automobile Manufacturers expects sales to decline versus 2010. In response to the 2008 worldwide financial collapse, Chinese authorities unleashed $2.1 trillion of stimulus, or almost 33% of GDP. This compares to the US stimulus of $800 billion, or 5.5% of GDP, spent on worthless Keynesian pork. Unlike the US, where no jobs were created, China’s command-and-control structure funneled the stimulus into building cities, malls, roads, office buildings, and residential units. Millions of Chinese were employed in creating properties for which there was no demand. Moody’s approximates that China’s banks have funded at least RMB 8.5 trillion (US$1.3 trillion) of the RMB 10.7 trillion of outstanding local government debt, which was a significant portion of the 2008 national stimulus package. When the central authorities tell the banks to lend, the banks ask, “How much?” The result has been soaring real estate inflation and malinvestment. China consumes more steel, iron ore and cement per capita than any industrial nation in history. It’s all going to railways that will never make money, roads that no one drives on and cities that no one lives in. It’s like walking into a forest of skyscrapers, but they’re all empty. There are 218 million urban households in China, and the central government ordered local governments to build 36 million more units by 2015. They just have one small problem: Prices for apartments in Shanghai and other major metropolitan areas have soared by over 100% in the last five years. The average size of a “cheap” apartment in second-tier Chinese cities is 60 square meters (650 sq ft) and fetches an average price of $1,230 per square meter, or $73,800. Mid-tier apartments in Shanghai or Beijing sell for $3,500 per square meter, or $210,000 for an average size apartment. “When prices are over 20 times more than annual household income, it’s not affordable,” says Andy Xie, an independent economist in Shanghai. Millions of working Chinese have been priced out of ever owning property and blame the corrupt local government cronies and connected speculators. Anger is simmering among the masses. No other government in the world would spend that kind of money. If you go to local Chinese cities, you will see what they spent that money on: Tens of millions on just trees, parks and government buildings. All of the major ratings agencies are warning about an impending banking crisis in China. Fitch downgraded the country’s credit rating and warned there was a 60% chance the Chinese banking system will require a bailout in the next two years. Just like the US, China has too-big-to-fail banks, with five banks accounting for 50% of the lending in China. In a July 2011 report, Moody’s cautioned that the non-performing loans on the balance sheets of Chinese banks could rise to between 8% and 12%, versus the 1% proclaimed by Chinese officials. China’s regulators have belatedly applied the brakes, but it is too late. The house of cards looks susceptible to just the slightest of breezes. If you are going to address the misallocation of capital in the banking system and credit system, that’s going to have huge knock-on effects on the profitability and viability of the banks. And if there were a major banking crisis, you would start to see money trying to get out of China. What would the government do to maintain stability? You could have a whole host of problems. It’s almost far too complicated to contemplate. There is one sure thing regarding bubbles: They always pop. It’s in their nature.